The Cyma Watch Co was established in 1891. 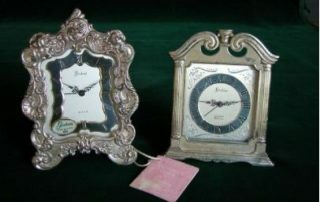 They made clocks from the early 1930s – 1970s. The calibre R10 was a 22 ligne (49.6mm) 30hr keywind time and alarm clock manufactured from 1945 – late 60s. This calibre progressed from 7 to 10 to 11 jewels over its period of manufacture. The movement was housed in a multitude of quality casing designs. This example is a special model produced for Gorham, a long established US silverware retailer. The unusual picture frame casing is sterling silver and in mint condition with its original tag and sticker on the glass and has its original box with padding. These are certainly unusual but not rare. Much rarer is the different sterling silver frame housing a Cyma Cal. R8.